How long can you stand up before you get tired? This is an important question for animals that sleep standing up, like horses and flamingos. Our joints are stabilized by muscles, but the constant activation of muscles needed to maintain balance requires energy and induces fatigue. 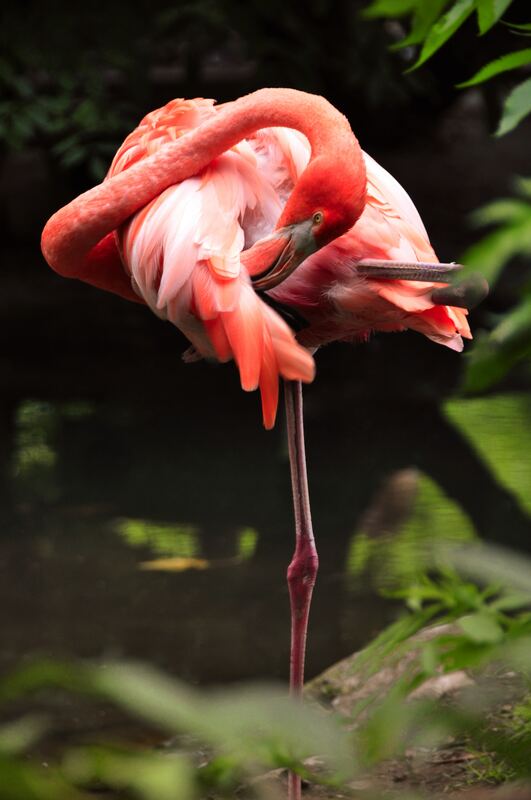 Flamingos are especially perplexing because they often sleep on only one leg. This requires that single leg to support the entire weight of the animal and maintain balance. Researchers think that this is beneficial because it allows them to switch legs when one gets tired. But does that benefit outweigh the cost of maintaining balance on a single leg? Researchers Young-Hui Chang at Georgia Tech and Lena Ting at Emory investigated this question in a recent paper by examining the muscle forces required to support body weight and maintain balance in flamingos standing on one leg. Using dead flamingos (that can’t generate active muscle forces), the researchers clamped one leg and tilted the cadavers forward and backward (video). They found that the leg remained straight even after rotating it more than 45 degrees in each direction. This only happens when the bird’s foot is right underneath its body, not when it’s off center (like it is when standing on two legs). This is remarkable, because flamingos’ femurs (the large bone in our thighs) are horizontal. Essentially, a standing flamingo is in a position similar to a human doing a squat! The researchers think that the bird’s bodyweight generates passive joint moments around the hip and knee, keeping the joints into a fixed position in order to support the weight of their body. A similar arrangement, called a stay apparatus, is found in horses for the same purpose, and bat fingers contain a similar lock that helps them stay hanging for long periods of time. While they were awake and active, the center of pressure moved a lot, but when they rested or fell asleep, they were remarkably stable. 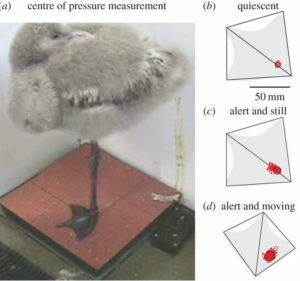 This led the researchers to suggest that the birds may have a way to balance without active muscle forces as well, although they do need to work actively to keep their balance when being active, like while grooming. For more takes on this story, check out NPR and The Conversation. Next PostHow do Hummingbirds and Nectar Bats Hover? The Shoulder: Super Joint or Super Hazard? Can we 3D print our own skin?